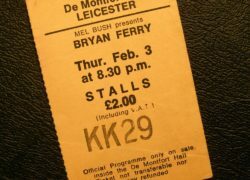 Item description: Brian ferry concert ticket for the 3rd February 1977 at the De Montfort Hall, Leicester. Orange paper ticket with black printing. 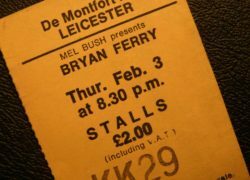 Background to Brian Ferry: Ferry formed Roxy Music with a group of friends and acquaintances, beginning with Graham Simpson, in November 1970. The line-up expanded to include saxophonist/oboist Andy Mackay and his acquaintance Brian Eno, who owned tape recorders and played Mackay’s synthesiser. Other early members included timpanist Dexter Lloyd and ex-Nice guitarist David O’List, who were replaced respectively by Paul Thompson and Phil Manzanera before the band recorded its first album. Roxy Music’s first hit, ‘Virginia Plain’, made the UK Top 5 in 1972, and was followed up with several hit singles and albums, with Ferry as their lead vocalist and occasional instrumentalist (he taught himself the piano in his mid-twenties) and Eno contributing synthesiser backing. After their second album, Brian Eno left Roxy Music, leaving Ferry its undisputed leader. Ferry had already started a parallel solo career in 1973, initially performing cover versions of old standards on albums such as These Foolish Things (1973) and Another Time, Another Place (1974), both of which reached the UK Top 5. After the concert tour in support of their fifth studio album, Siren, Roxy Music temporarily disbanded in 1976 though band members Paul Thompson, Phil Manzanera and Eddie Jobson took part in recording Ferry’s subsequent solo material. In 1976 Ferry covered a song by the Beatles, ‘She’s Leaving Home’ for the transitory musical documentary All This and World War II. He went on to release three solo albums during this period, Let’s Stick Together (1976), In Your Mind (1977) and The Bride Stripped Bare (1978). All three albums reached the UK Top 20, but by this time his career had begun to wane. Roxy Music reconvened in 1979, with Ferry, Manzanera, Thompson and Mackay (Jobson was no longer a member). The band recorded the albums Manifesto (1979), Flesh + Blood (1980) and Avalon (1982), the latter two reaching number one in the UK album charts. The band also achieved their first and only UK number one single, ‘Jealous Guy’, released in 1981 as a posthumous tribute to its author John Lennon who had been murdered some months earlier. It was the only one of their singles not to be written or co-written by Ferry. After lengthy tours to promote the Avalon album in 1982, Ferry decided to put Roxy Music on hold and continue as a solo artist.